New Haven produced many collectible clocks. The New Haven Clock Company was one of the primary clock makers of the 1800s. 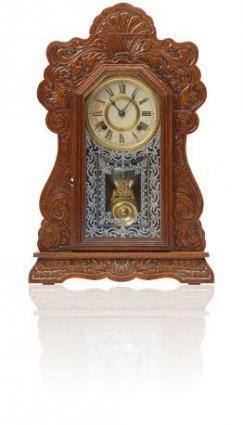 The beautiful clocks that the company created are still sought after by collectors. In the 1850s Jerome Manufacturing was the largest clockmaker in the world. Several clock makers joined together in 1853 to supply the company with clock movements. New Haven Clock Company was created for this purpose. By the 1900s the company had added wrist watches to their inventory and continued to produce these until 1960 when the company went out of business. Because of the link with the Jerome Company, New Haven Clocks may be found with the trademark "Jerome & Co." Since Jerome was much better known worldwide than New Haven, the company used this trademark until 1904. The company also used its own name, New Haven Clock Co. It can often be found printed on the face of the clock, pasted in the case, or on the back. Identifying an antique clock is usually not difficult. One of the most popular styles of clocks made by the New Haven Clock Company is the mantle clock. If you are lucky enough to have one of these beautiful antique clocks you will want to preserve its beauty and usefulness. It is important to choose the location carefully. Choose a surface that is even. You should check this for accuracy with a level. If the base of the clock is off balance even a little the pendulum will not swing properly. Never force the hands to move when setting the time. Always move the hands in a clockwise direction. The one exception is if you need to set the chime. Slowly move the hour hand counterclockwise from 11 to 9 until the clock chimes correctly. Never use force. Remove the pendulum before moving the clock. Use a gently glass cleaner or vinegar on the glass to clean it. Don't spray it on the glass, instead spray a little on a soft piece of flannel and rub the glass gently. Since these clocks were made in such a large amount there are many available to collectors in almost every price range. Locally keep an eye on antique stores and auctions. You won't often find one at a garage sale or thrift shop because people usually have an idea of the value of these collectible timepieces. If you don't have access to antique stores or you can't find what you are looking for locally there are a number of resources on the Internet for these clocks. No matter where you get your antique clock, or what style you get, you will be sure to get an authentic vintage look in your home with an antique New Haven clock. Ask the seller how to do various adjustments, as well as how to set and care for the clock once you get it home. These popular clocks have been keeping time for over a hundred years and they could easily last a hundred more with the right care.